A lot of people don’t understand some nuances of blogging. Yes, I am a blogger, but a large part of what I do does not entail writing. Between all the sites I contribute to I try to have at least 5 posts per week, which does in fact take time and lots of typing. But blogging is not just about me facing my computer and spewing forth whatever ideas I may have at the time. Although I do admit that that does happen quite a bit. Blogging is a conversation. With others. Because otherwise I would just be talking to myself. And that is no fun. To participate in this conversation I have to see what others are saying. So basically I read a lot of other awesome blogs all day and call it research. Best. Job. Ever. Then, once I have read what other people are saying, I am ready to put in my two cents worth. Also, as mentioned above, sometimes I read what everyone else is talking about, and I don’t get it. So I just kind of go into my own little corner and write about totally random business. But I had good intentions. And you know what they say about those. So I have written my blog. And I posted it. Then hubby points out all the typos and grammar errors. I honestly wish there was a system where I could get him to point all those out *before* I post publicly. But since I have all of two followers, the chances of anyone noticing are pretty slim. If I ever become famous maybe I will work out some sort of system where that happens so I am not making a fool of myself in front of everyone. Not that my blog doesn’t do that for me anyhow, but I would rather be remembered for other follies than “poor English skills.” I know, maybe I will start editing my own stuff. Or ask hubby to do it before I post. I like the second option better. See? All sorts of work has gone into blogging already, and I am not even done. Alright, so my post now looks decent enough to really present to the world, so I have to network to get it viewed. Sure, part of networking is posting the link to my stuff on Twitter and Facebook. But no one likes being spammed with nothing but links all day. I honestly try not to just do that very often, but I have been guilty of it in the past. Not to mention so many people say interesting things on Twitter and Facebook I can’t help getting caught up in the conversations. I call this step being a Networking Maven. Hubby calls it Tweeting all day. Blogging is much more than just writing a few posts. So yes, I write. A lot. But an even larger part of what I do is building an online presence. Meaning I stand in front of my computer yelling “I am here! I am here!” Oh, is that not how computers work? See! I constantly need to tweak my system and find better ways of communicating with people. Because that is really the essence of blogging. Communication. And spending a lot of time doing absolutely nothing but calling it work. P.S. 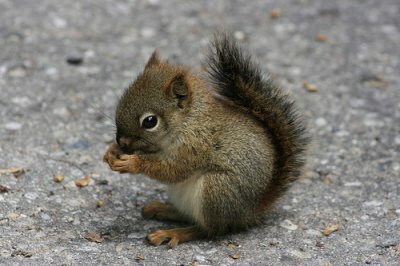 I am sure some of you may have noticed that the cute squirrel picture I am using for this post has absolutely nothing to do with the content. That is yet another facet of blogging, looking up cute pictures online.